Happy New Year! This is my first blog post for the new year and Alisa with Roses, from Mo's Digital Pencil, is such a beautiful image with which to start the year off. I have used Pink Paislee's London Market for my paper. I got the idea for the hearts from a beautiful layout I saw on the Maja blog as well as the pleats on the right hand side. I actually cut a butterfly from the paper and hid my cut using the peaking pleats. The frame is on ei made using the Martha Stewart molds. I used WOC flowers and metal corner and of course Copic markers to color! The colors are my usual suspects, very similar to this post and this post. The only differences are that I used E21 and E13, also, for the skin and V000 in place of the RV000. Thank you for visiting today! Don't forget to stop by Mo's Dream Team blog to get twice daily inspiration! What a fantastic card - it showcases Mo's image perfectly!! Oh she is beautiful. Love your card!!!! I have become a follower and hope you will come visit and follow me as well. Great card,love the papers and image. Love all the beautiful detail in this card! Thanks for participating in the Dazzling Diva Challenge. Hi, Danielle: I love your entry--ssssooo pretty especially your details. Thanks for entering our Challenge #52 - "Anything Goes"
Thanks for joining Sister Act Card challenge. Have an awesome day, Danielle! Lovely image & coloring! 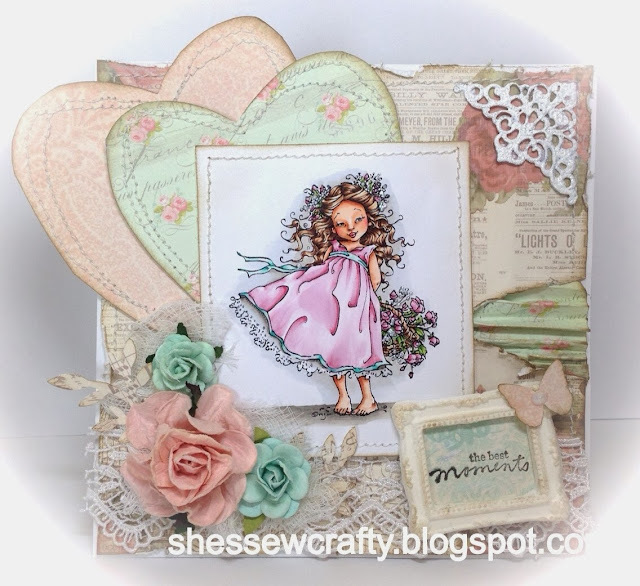 Such a pretty card...Thanks for sharing with us for the Anything Goes Challenge on the Card Makin' Mamas Challenge Blog! Hi Danielle and Happy New Year! Shabbylicious is all I've got to say! Gorgeous colouring, and I adore the pastels. Thanks so much for sharing your adorable card with us at LLC.